Don your boater and hire a roaming dixieland band or bring the spirit of the Caribbean to your summer garden party or corporate event with one of our steel bands. Our wandering bands and musicians can all perform “unplugged” if required, so they’re not constrained by power supplies or heavy speakers. This allows them to roam freely around your event, play in several locations or even blend in with and surprise guests. 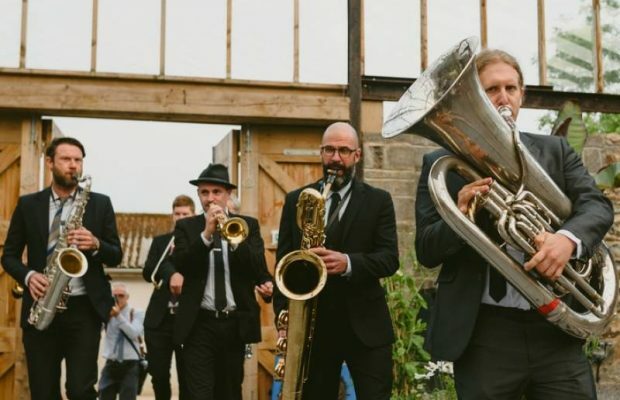 We have a range of bands for cultural and themed events, including roving brass bands for Oktoberfest, medieval minstrels, mariachi bands, and French musette duos. Our roving singers include acappella vocal groups as well as singing acoustic guitarists for serenading guests. In addition to wandering entertainment, we’ve also included bands here who would ordinarily use power but can perform unplugged on request. Vastly-experienced Dixieland jazz band playing songs in the classic New Orleans style. Great for background music or wandering entertainment. Larger line-ups are available for dancing too. Sharply dressed wandering band delivering fun and enticing arrangements of classic and modern songs, featuring vocal harmonies with bags of energy and personality. Additional musicians and acoustic/electric options also available. Charming and sophisticated duo-quartet performing classic French songs and folk music for listening and dancing. The duo can perform unplugged, allowing them to wander between tables or groups of guests. Vibrant, modern acoustic duo playing the latest pop songs, ideal for weddings and background music.